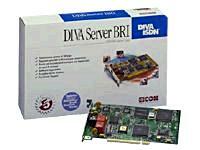 Eicon Technology's DIVA Server BRI is a high-performance, active ISDN card for the small office that provides both digital and analog connectivity over the ISDN line. The DIVA Server BRI's on-board Digital Signal Processors (DSPs) allow one server to support communications with ISDN devices, V.90 analog modems, fax machines, and GSM-compatible mobile phones. A mix of any two call types can be supported simultaneously making it an ideal open communications platform to handle your fax server, unified messaging and remote access server needs.